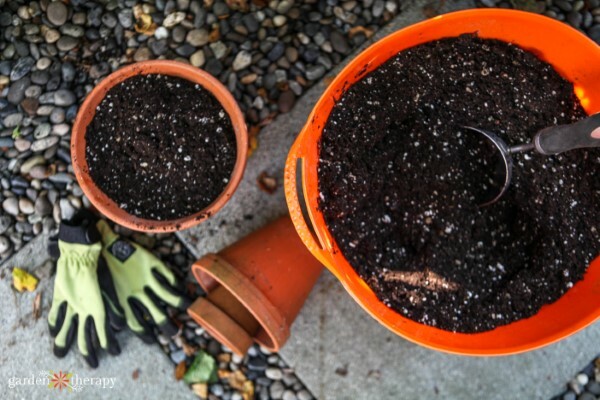 As the season starts to change from the hot long days of summer to the cooler, shorter days of fall you may be wondering what to do with your container gardens. Containers are the perfect way to garden in a small space like a patio or a deck. But containers also make for great features in large gardens. Either way, containers draw the eye, and in the fall they need some care and maintenance. 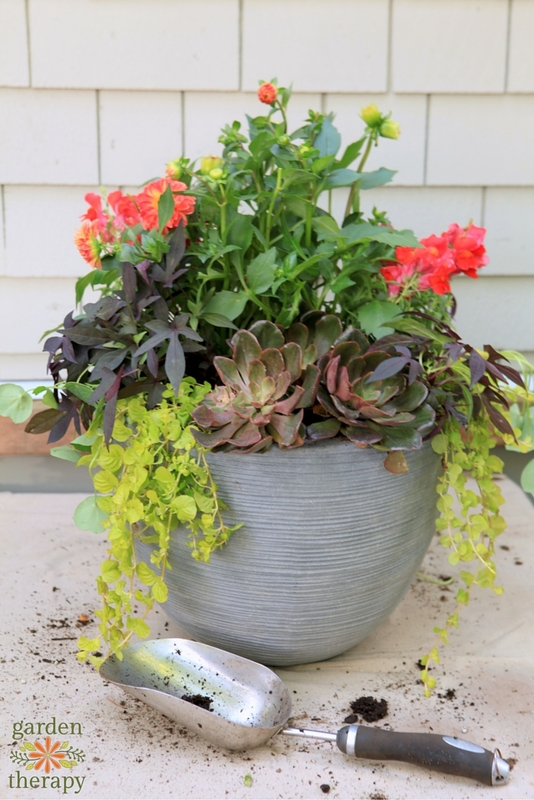 Follow these tips for a perfect fall container garden. Container gardens are usually put together in the spring with catchy sounding design strategies like the Thriller, Filler, Spiller or Clock Face design. With proper light and adequate water, they bloom and grow lush, overflowing their pots. Near the end of the summer, the plants will start to look a bit tired. They’ve worked hard to grow in a confined space and it’s time for a little care. 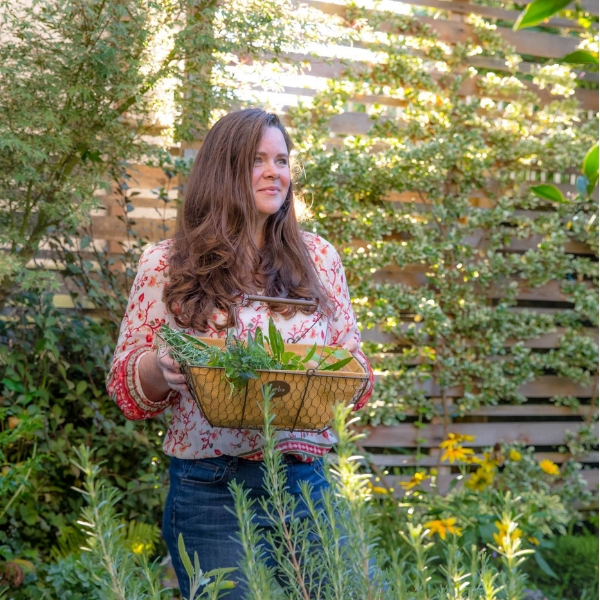 Here are some tips for how to refresh your container gardens and transition them into fall. 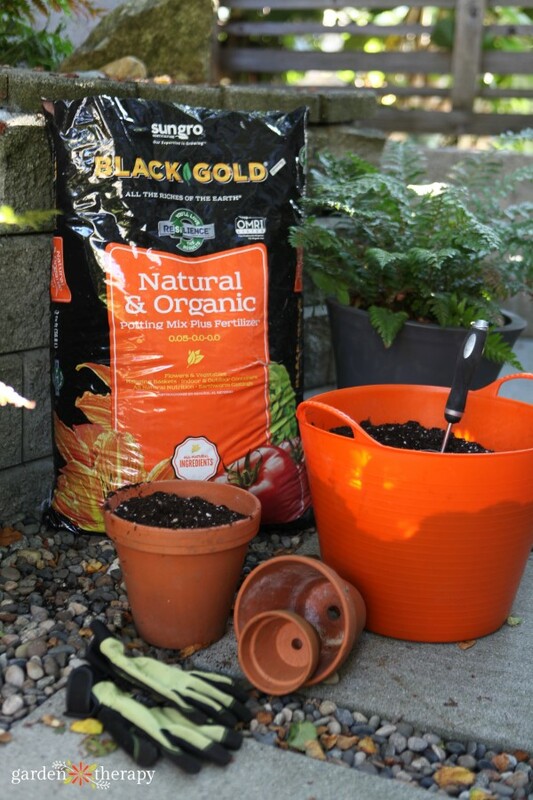 Sponsored Content: this post has been sponsored by Black Gold®, who also provided me with the OMRI Listed® (organic certified) potting soil and amendments to freshen up my fall containers. 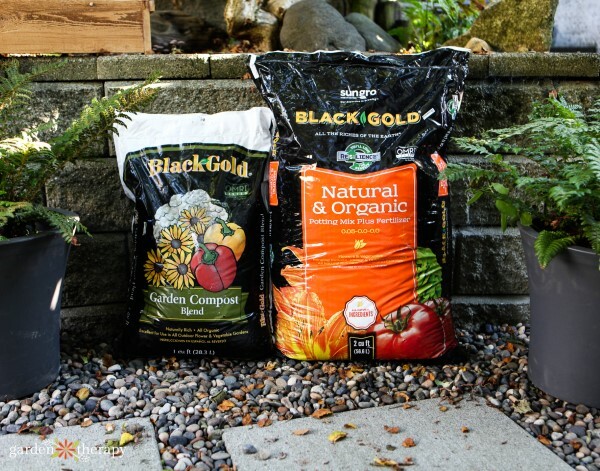 This month they are also sponsoring a Garden Cleanup Giveaway that will include two Smart Pot® Compost Saks, a Rake, a Leaf Hauler, and two bags of Black Gold® Earthworm Castings ($145 value). Enter here! Whether you’re growing vegetables or flowers in your containers, fall is a great time to clean up the container and prepare it for winter. Here are a few things you can do. 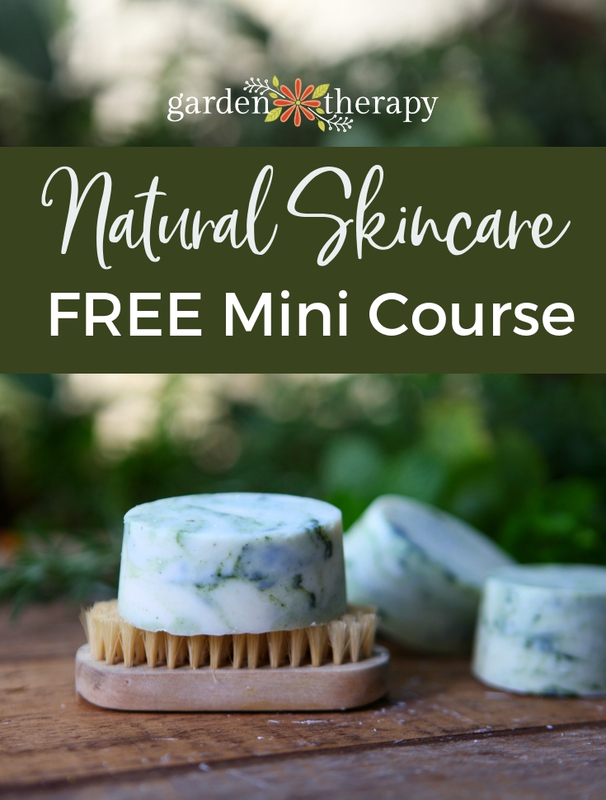 Cut back any of the 4D’s: dead, diseased,damaged, or dying plant material and discard it. Harvest any vegetables that are ready to be harvested for fresh eating or preserving. Deadhead any blooms to encourage new blooms and extend flowering time. Allow flowers and vegetables to go to seed so you can collect and save seed for next year. Remove any overgrown perennials, shrubs, or trees, and plant them in the garden or a larger pot. When the plants are finished fruiting, flowering, or producing seeds and you have harvested all that you need, remove all the remaining plant material from the pot. Use a soil knife to loosen up the soil around the roots and remove the plants and root balls from the soil. If the plant has become root bound and the entire pot comes up in a net of roots, you can toss the whole thing in the compost bin. If the roots do not extend throughout the entire pot, then shake off the soil into a large bucket or a wheelbarrow. 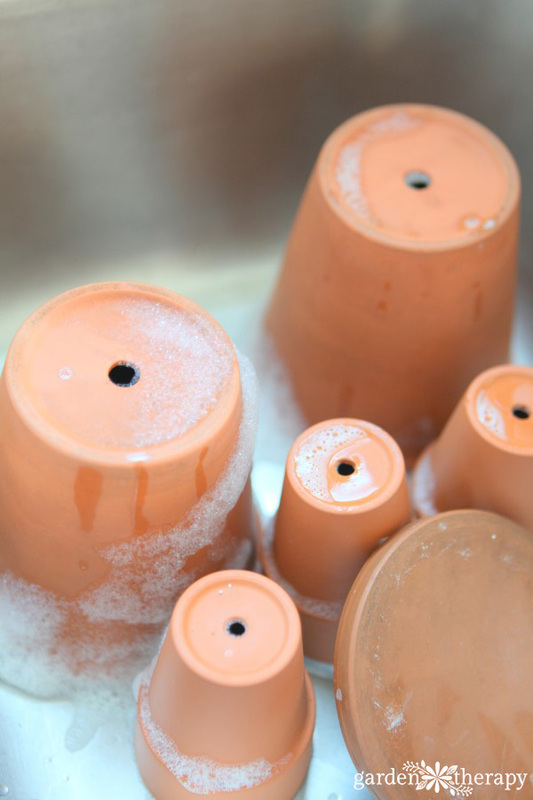 Wash the pot well using soap and water before replanting or storing the pot for winter. You can also divide and transplant any perennials that are growing too large for their container. See how to divide perennials here. Precious or more tender plants may need to be moved into an unheated garage or indoors for the winter. I overwinter all of my hardy winter succulents in unglazed terracotta pots under a deck or under an outdoor bench. 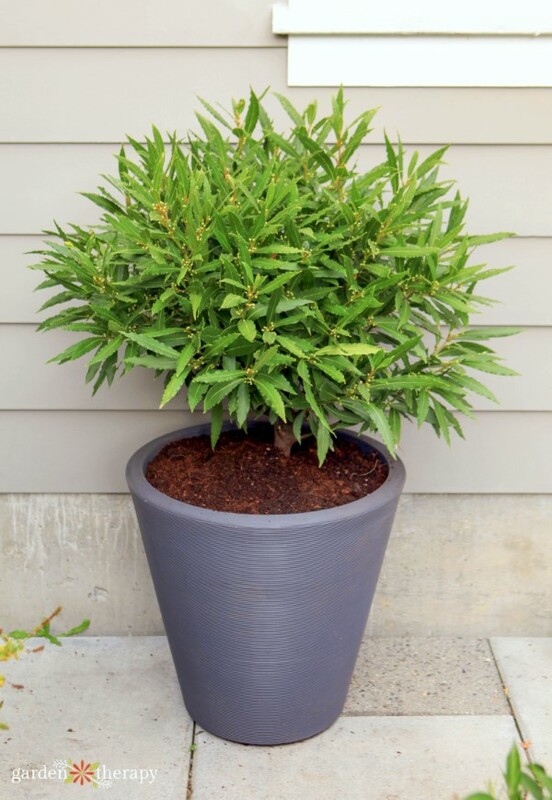 Trees and shrubs in containers are more vulnerable to frost damage than those in the ground because the containers have less soil mass and the roots are less insulated. 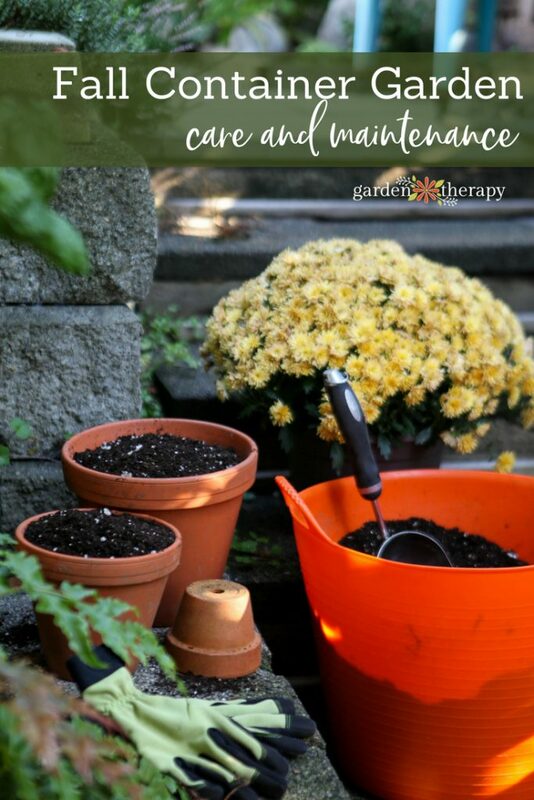 For smaller pots or more tender perennials, trees, and shrubs, move the containers to a warmer, more protected spot in the garden under a deck or covered area that keeps snow and frost off of the pot and plants. Large planters or trees that cannot be moved can be insulated using burlap or chicken wire and straw. The book Container Garden Complete by Jessica Walliser has a great section in chapter 5 on the details of how to overwinter both tender and hardy plants which I refer to often. At the end of the season, it’s a good time to freshen up your soil. You can discard the whole lot of it and replace the soil with a fresh bag of soil like the Black Gold® Natural & Organic Potting Mix which contains a special blend of Canadian Sphagnum Peat Moss, Composted or Aged Bark, Compost, Earthworm Castings, RESiLIENCE®, Horticultural Grade Perlite, Pumice or Cinders, and Organic Grade Fertilizer. Or you can refresh your existing container soil by adding new materials. 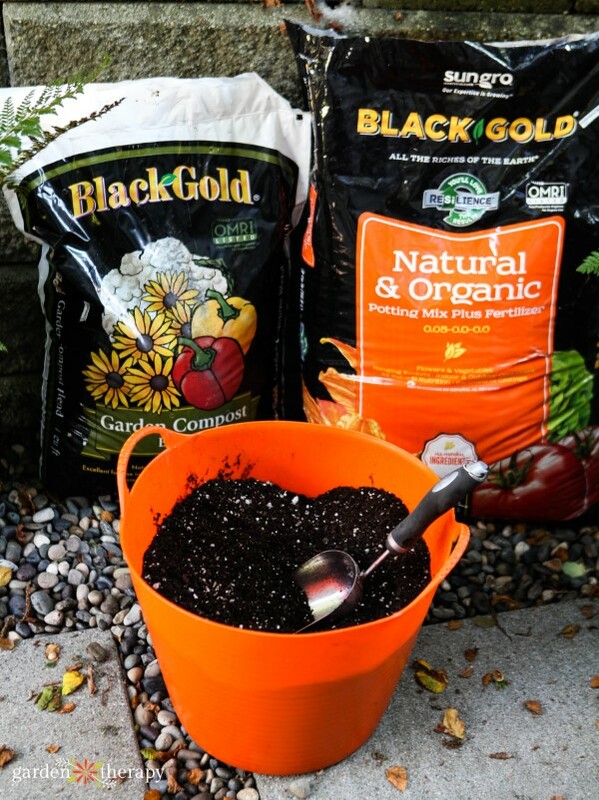 If there were no signs of disease or pests on the plants or in the soil, the soil can be reused by mixing it in equal amounts with Black Gold® Garden Compost Mix, and Black Gold® Just Coir. 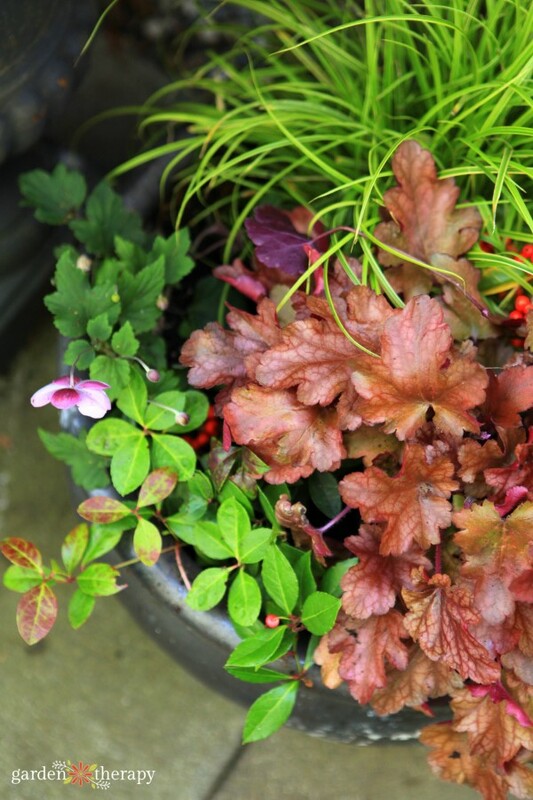 Mix 1 part of your existing soil with one part Black Gold® Garden Compost Mix plus one part Black Gold® Just Coir in a wheelbarrow and then add in a variety of perennials with vibrant foliage color like Heuchera, Euonymous, Sedum and Gaultheria. Mix 1 part of your existing soil with one part Black Gold® Just Coir and add in fall-themed plants for the holidays. At the end of the holiday season when the pumpkin is starting to decompose, remove any perennials and simply discard the whole planter—soil, pumpkin, and spent plants—into the compost bin. Plan for a gorgeous spring display by loading layers of spring bulbs into a container filled with Black Gold® Natural & Organic Potting Mix. 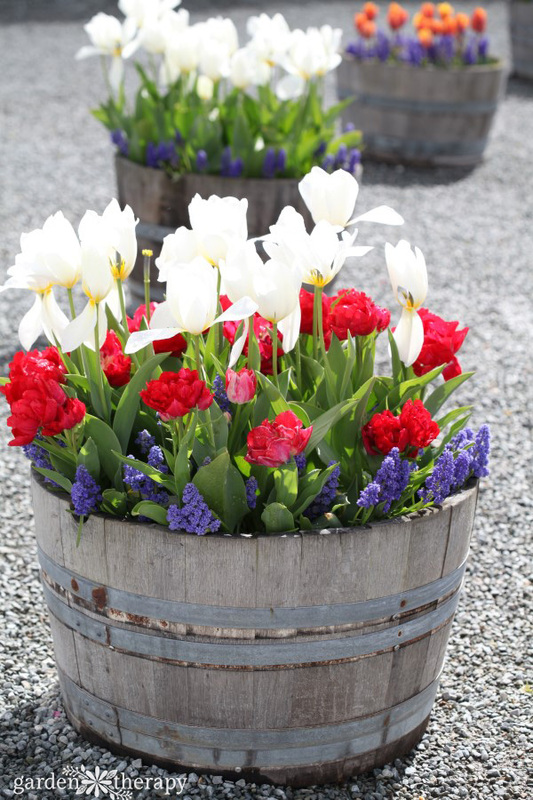 Layer and plant bulbs so that you get a continuous display of gorgeous flowers throughout the spring. Make a soil mix that is light and airy to keep the bulbs insulated through the colder months. Hardy bulbs that need a winter’s chill can be planted in a pot and then the pot can be moved to an unheated garage, under a deck, or wrapped with insulation to keep the container and bulbs chilled but not freezing. In the spring when the soil warms up, move the container into place and watch how fast you get to see the show. In areas where winters are mild, the container can be left in place with a winter arrangement decorating the soil above the bulbs. 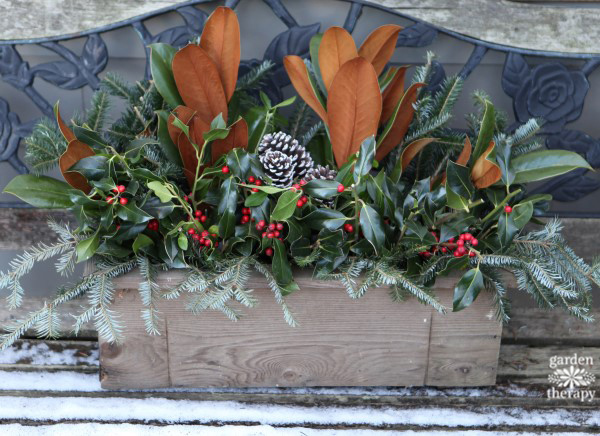 These displays need no special soil as the plants used are cut branches and leaves used as an outdoor botanical arrangement that will be discarded in the spring. No additional soil or fertilizer is needed as the old potting soil can be used to hold the arrangement in place. Simply add in cut evergreen branches along with decorative cones and seed heads to make a festive display to last until spring. 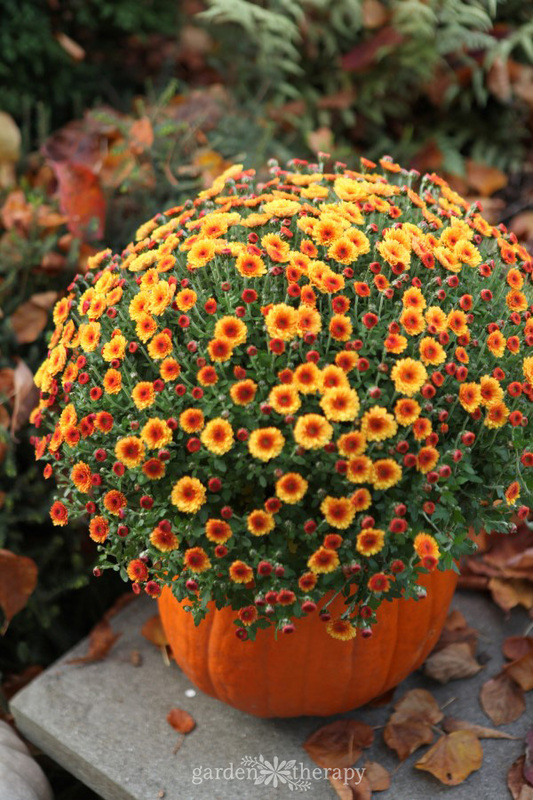 What do your fall containers look like this year? Let us know in the comments below!